I’ve enlisted my boyfriend Ricky to help collect capers. 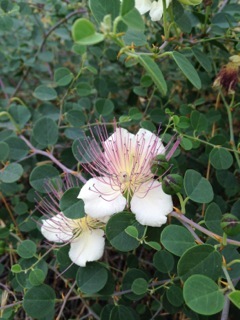 Capers are the pickled, or sometimes salt-cured, unopened flower buds of Capparis spinosa, a plant that is native to Mediterranean countries. It sure as heck doesn’t grow back in my old Brooklyn ‘hood (but for my BK buddies and others cold-winter climes, you can make a nice mock up version by pickling nasturtium buds). Collecting capers is a delicate, time-consuming business because the plants are thorny and primed to snag both clothing and skin. 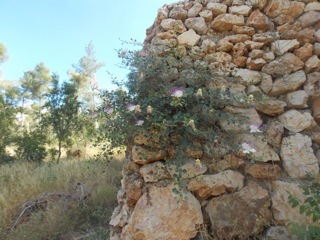 They are tough perennials that frequently grow out of rock walls and other dry spots. The delicate looking flowers give no clue as to just how tough a plant this is. 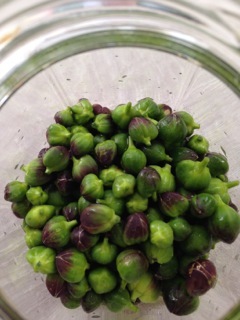 Unless you’re salt-curing them, capers need to be soaked in changes of water for three days before they are brined. This means some caper management if you’re bringing home a handful a day and trying to keep track of which have soaked for how long. Once cured, capers are an essential ingredient in many dishes such as pasta putanesca. 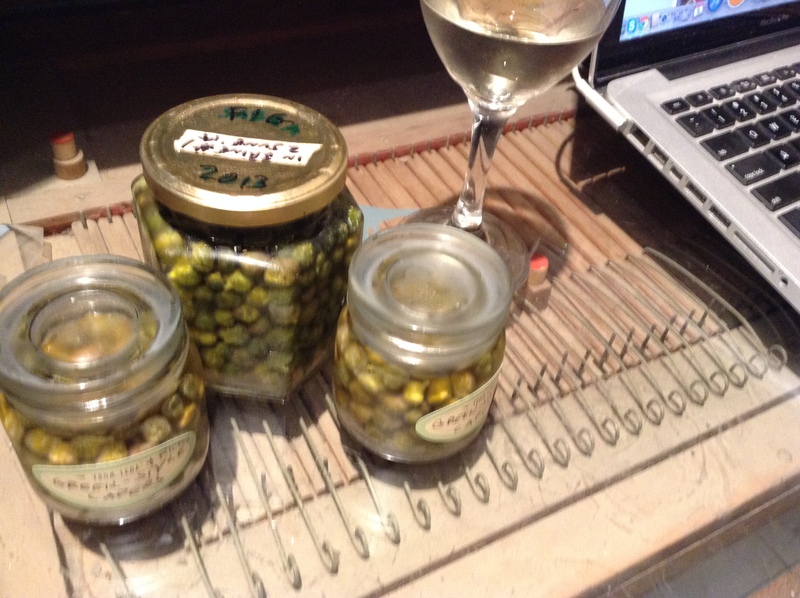 I’ve decided that since the plants are so prolific here, we shouldn’t ever have to buy capers. Ricky points out, jokingly, that if you calculated our hourly wage for collecting and curing them these would be the priciest capers ever. Okay, but that’s not the point. 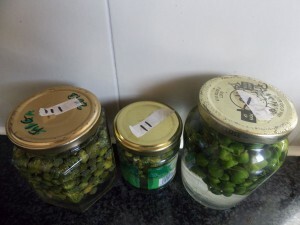 The point is that they will be our capers, and they will be delicious, and we had fun together while we were outside gathering them. I’m trying four different versions of curing them: 2 in vinegar-based brines, 1 lacto-fermented, and a simple dry salting. I’m also going to put up a jar of the immature fruits to see if we like those (you see them for sale sometimes). Here’s the recipe for the simplest vinegar brine method that I tried for the first time last year, other recipes posted as soon as I’m sure they’re good. Changing the subject for a shameless plug moment, I really enjoyed doing the interview for this post on the New York Botanical Garden’s site. It was nice to be asked thoughtful questions such as whether and why kids should be taught foraging.